2 Bedrooms, 2 Bath Condo~Top floor, corner unit with amazing ocean views! Unbelievable views and privacy offered in this top floor, corner unit located at the popular Papakea Resort. Instead of being surrounded on both side by neighboring condos, our unit feels much more open and private with the wrap around balcony and no one on our left... just miles and miles of beautiful ocean sunsets! Our Resort is a low rise complex , 4 story, which Includes elevator and free parking. Our updated unit has been fully remodeled & upgraded, ~ (we are unit #L401). Check out our reviews and pictures along with the video of the interior for a taste of what it looks and feels like to stay at our wonderful condo!! Brand new tri- zone A/C installed in 2016 which really cools the place down during warmer summer months. All new tile floors, kitchen, master bath and fresh new paint throughout with new carpet as of 1/1/18. The condo has vaulted ceilings, ceiling fans and air conditioning in each room, 2 flat screen TV's located in the master bedroom and living room. Also, a brand new refrigerator in Jan 2019 and 'Bosch' washer, dryer, oven/range and dishwasher installed in Nov 2018. It is one of the largest units in the complex (sleeps six comfortably). Located in the ocean front desired L building and being a top floor corner unit it feels much bigger and open than the other units! It truly has the most wonderful views at the resort. Fall asleep to the lapping ocean waves and dine on your own private lanai with the beautiful views and sounds of waves crashing! BBQ daytime or evening meals at the torch lit pool area. Enjoy the manicured lawns, the beach, lounge by either of the 2 pools, take a swim in the warm, ocean waters only feet away, walk the sandy beaches, or curl up and read a book. Enjoy Papakea's lush gardens including koi fish ponds and 2-18 hole putting greens and tennis courts. This Condo is a spacious, two bedroom, two bath, second BR/BA is a private, charming loft with one queen and one trundle bed (most suitable for children). There is a Pack & Play, high chair, and beach sand toys for the little ones! Also, includes putters for the 2 putting greens on site and the front desk supplies tennis racquets for the lighted tennis courts and additional putters to use for your enjoyment. We have a couple boogie boards, and you never know, another guest may have left a couple additional boogie board as well!! Yoga classes and water aerobics are offered on property. There are 2 Shuffle boards by each pool area. 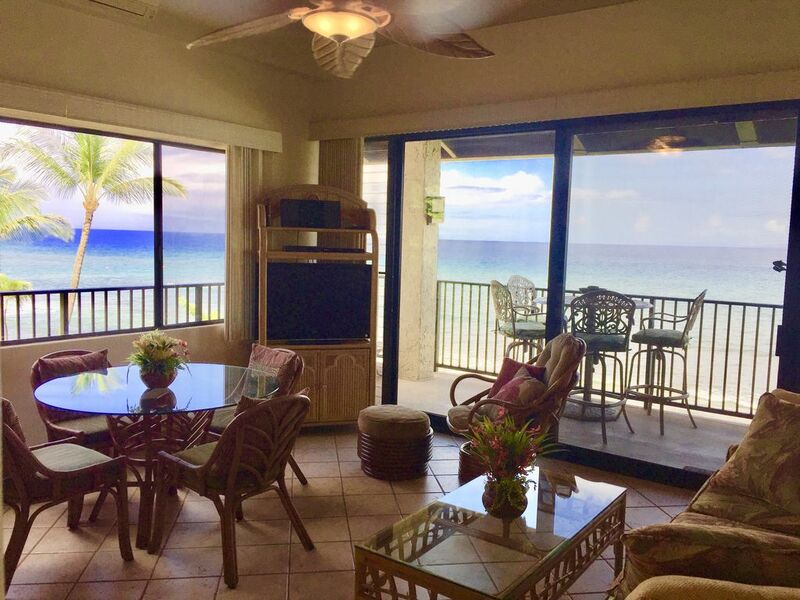 After spending a sunny day snorkeling, exploring, shopping or simply hanging out sunbathing, imagine relaxing on your lanai watching the sunsets and listening to the waves, capturing the stars in the evening and enjoying the sounds of nature. The only one missing is YOU! There is a Concierge desk at PAPAKEA to help you plan your Expedia activities at the front office. Papakea is located on Kaanapali Beach with stunning views of Lanai and Molokai Islands. Amenities include fully appointed Kitchen, Living Room with private Lanai, perfect for sunset dining, whale watching and sunrise coffee. FULL USE OF RESORT AMENITIES... Two private pools with restrooms, two Jacuzzis, four saunas, beachfront access, three lighted tennis courts, two shuffleboard courts, two 18-hole putting greens, and 12 Gas BBQ's at Poolside. Magnificent 13 acres of lush grounds...with Koi ponds and lush gardens. Sister resort 'Kaanapali Shores' right next door offers fitness center for a small daily fee, shops and the charming open air 'Beach Club' restaurant! GREAT LOCATION... Papakea Resort is a tropical oasis on 13 acres of beautifully manicured grounds in upscale West Maui. The Five Star Award has been given to Papakea every year since 1987 by Interval International, one of the largest travel organizations in the world. Located between the Kaanapali and Kapalua world-class golf resorts and minutes from shops, museums, restaurants, and galleries in nearby Lahaina and Whalers Village. **Maui's newest Restaurant on North Beach in Ka'anapali, 'Duke's Beach House' is within walking distance from our condo!! Jog or stroll down the Kaanapali Boardwalk to this first class dining experience which It offers stunning views out to the Pacific Ocean and of the islands of Lanai and Molokai. Local musicians and sunsets will make your evening most pleasurable. Dine at the 'best table' on your own private lanai morning and night! BBQ daytime or evening meals at the torch lit pool area. Enjoy the manicured lawns and koi ponds, the beach, lounge by either of the 2 pools, hot tubs, take a swim in the warm, ocean waters only feet away, walk the sandy beaches, or curl up and read a book. Enjoy Papakea's lush gardens including koi fish ponds and 2-18 hole putting greens and tennis courts. NOTE: If you like our condo, please plan ahead as we quickly book up months to a year in advance. It best to send us an inquiry or call so that we may confirm the dates...especially around the holidays and summer months. PAPAKEA is a low rise, four story building with elevators, very unique, private and enchanting! We are from northern California and always wanted a vacation home on the ocean. It is the perfect place to just get away and relax....relax/whale watch from our lanai/golf/swim/sight see and do whatever you like! We also liked this property for our children and friends to visit, as it offers something for everyone. We especially enjoy the "Aloha" spirit and the friendliness of the island people. Our favorite thing about the condo are the unobstructed views and beautiful sunrises and sunsets! Please remember to view our video on this website! Aloha, and enjoy your vacation in beautiful Maui! The first time we visited this condo, we were in awe of the beautiful views and the amenities. We liked all of the upgrades, which made it very comfortable and enjoyable. The view off the Lanai is so incredible, and the sound of the waves is soothing. It is very conveniently located in an area where you can walk to local restaurants, shop for groceries and visit other resorts. Kanapali golf course is 2 miles south and the Kapalua golf course is 5 miles to the north, where you can find world class dining and breath taking views. Lahaina is 8 minutes to the south and always a fun place to go for shopping/dining. Swimming, surfing and snorkeling right out your back door. Big green sea turtles year round, and seasonal whale watching during the winter months even from the Lanai. Amazingly you can even see the whales breech! Newly purchased 2 flat screen TV's in the condo, DVD player, Stereo & I-Pod for your music, fully appointed kitchen, putting greens, 2 swimming pools and spas, shuffleboard, tennis courts, Koi ponds, gardens, and an activities coordinator at the front desk to help you plan all of your activities. It is so nice to barbeque right down around the pool area..Another great thing about the condo is that we are a top floor corner unit, so we have a private Lania with wrap around views! We love the ocean front setting with unobstructed views of crashing waves, and the islands of Molokai and Lanai. You can stroll south along the beach for miles and or hop on the Boardwalk to Whaler's Village. News!!! We installed a brand tri- zone AC in 2018 to keep each room in the and condo real cool!! Showers in both bathrooms located conveniently near both of the bedrooms. Blow dryers and and spacious cabinets in both bathrooms. Granite counters in downstairs bathroom. Fantastic ocean front!! No obstruction. Listen to the waves as the ocean is just feet away! The tides come and go, there are days where there is lots of sand and then days where the tide is up! Phone in unit , free local calls. New "Tri- Zone" AC installed 2018! Separate controls for each room. All linens provided, including bed sheets, pillows and pillow cases. Free parking, lots of parking very close to the building! All bath, kitchen and beach towels provided. An initial supply of paper towels, soap and toilet paper are there upon arrival. In each building there is an outdoor elevator to help when bringing up luggage and or big trips to the grocery store! Panoramic views! Dining room table overlooking the sunsets! Complimentary servings of coffee upon arrival, sugar provided. High chair stored in bedroom closet. Table seats 4 and we also have 4 stools at the beautiful granite counter! Enjoy the manicured lawns surrounding the resort. Your own wrap around private Lanai to watch the sunsets and sunrises with unobstructed views!! Wrap around private balcony to watch the beautiful sunsets, gaze at the stars or watch the sun rise with a warm cup of coffee!! Boogie boards are usually kept in the bedroom closet or found under the bed. Some snorkel gear, and you can check at the front desk to rent snorkel gear as well. Lighted Tennis Courts~ rackets in unit. Putting green right on the property and many near by golf courses...putters are free to check out at front desk. We also have 2 putters in our unit! Enjoy the manicured lawns, the beach, lounge by either of the 2 pools, take a swim in the warm, ocean waters only feet away, walk the sandy beaches, or curl up and read a book. Ceiling Fans, AC, Vaulted ceiling, Top Floor in the beautiful ocean front 'L' building, fully appointed Kitchen, Cooking Utensils and serving pieces, 2Pools, 2Jacuzzies, pool cabanas, with restrooms,(shared), Outside Gas Grills (BBQ), Wireless Internet, 2 Flat screen TVs, I Pod/CD/DVD player, Activities Desk, Friendly Front Desk, Washer & Dryer in unit, hair dryers, iron and ironing board, beach toys, boogie boards, 2 folding beach chairs and swim gear! We enjoyed the condo. Everything thing was good except the upstairs ceiling fan did not work. It’s a nice location in Maui. We did see a lot of whale activity from our lanai! Glad you had a great time! The whales are amazing and we love the views from our lanai as well!! Thankfully we have air conditioning units in each room in the event something like a fan stops working. Guests are always encouraged to call us if they have a problem. This is why I send each guest our card, we are just a phone call away and very conscientious to respond quickly and efficiently. As popular as our condo is, things are bound to happen, however our maintenance crew is excellent and quick to get things fixed or replaced. Mahalo!! We love Papakea unit L401. AC and ceiling fans keep this condo cool when it's 87 degrees outside. We've enjoyed and participated in the amenities of the resort. Highly recommend swimmercize in the pool. This unit has everything we needed for a relaxing vacation. Located perfectly next to a "sister" property that has a full service restaurant and shops. A short jaunt into Lahaina for shopping and more food choices. Safeway grocery available in Lahaina and "Times" grocery across street from condo. Easy. We will return. Thank you so much for this nice review! We are so glad you were able to make it after all, and would love to host you anytime down the road! Hoping your memories of your stay will be a blessing to you! Aloha! Just recently returned home from our stay in maui. Loved the location and loved the unit. Valerie was very accomadating and very good to communicate with. Would not hesitate to book this unit again. Everything you need is there and must I say again, location was excellent. Thank you so much for the nice review! You were terrific guests and we would love to have you back anytime! So glad you enjoyed your stay! Mahalo!! Great location, fantastic ocean views and beautiful sunsets. The location of the condo north of the town of Lahaina is fantastic. You can walk across the street for groceries, coffee, etc. Within a 10 minute drive you can get to many restaurants and fantastic beaches. It was a relatively easy drive from the airport (40 min or so), and you can get to great snorkeling trips from Ma'alaea harbor in 30 min or so. The only drawback to the location is that while the condo is ocean front, it's not beach front. You need to travel to go to a beach, and to get to a really good one you need to drive. The condo itself worked very well for us (2 adults, 2 kids 11 and 13). It's very comfortable, and the kids like the bedroom up in the loft. The views are amazing, and it was nice to sit out on the lanai with a glass of wine and watch / listen to the ocean. We ate all our dinners out, but we had many breakfasts and lunches in the condo, and the kitchen was well equipped for it. The complex has a nice pool that is very convenient to the condo, and we spent several hours just about every afternoon there. The only drawback to the pool is that there are a LOT of restrictions that affected how a normal 11 yr old would have fun in the pool. No jumping in the water, no balls, etc. They still had a lot of fun though, and it was refreshing after you come back from the beach. Thank you for your nice review. Glad you enjoyed your time at our condo! We try hard to make our place as comfortable and cozy as possible!! As far as the beach goes, It's crazy how the tides come and go! There are times where we have plenty of sand and then there are seasons where the tide is up! It's nice that when/ if the tides are up, local beaches are not too far of a drive! Also, glad your kiddos enjoyed the pool. The rules for the pool are just for safety reasons. Our security guards are always out and about to make sure that everyone has an enjoyable, safe and relaxing vacation. Mahalo! If it's not enough that when you walk in the door, you are greeted with the most stunning view, or that the layout of the space is perfect (with a cozy loft and private bathroom upstairs and spacious king bed and additional bathroom downstairs), or that the kitchen has everything you need to prepare home cooked meals, or that you are so close to the ocean that the gentle lapping of the waves will lull you to sleep, or that the patio is the perfect place to enjoy your coffee in the morning or your glass of wine at night, or the numerous amazing amenities (including sparkling pool and hot tub, bbq, shuffle board and putting green etc...), or the great local tips you will get from the front desk staff, or the perfect location of the resort (in excellent proximity to everything, yet still very private).... then you must go to this place for the gracious, generous and extremely accommodating nature of the wonderful host (Valerie). Our every need was seen to with fast communication and kind manner. To be sure, we will be coming back!! Most excellent in every way!! Thank you very much! We sure appreciate your review and welcome you back in the future as our guests! Absolutely love this condo. Everything you need for a great vacation. We loved the view, the amenities, and the location (close to shopping center, coffee, etc). Valerie is extremely helpful and quick to respond. Would definitely rent L401 again! Thank you so very much! It is a special thing to be able to offer our condo to our guests who we often times see over and over again! Hope this is the case for you and your family!! Have it all at Kaanapali Beach, from relaxation (sunbathing & people watching) to Adventure (whale watching, scuba diving, snorkeling, deep sea fishing, inter-island excursions, & rock climbing). Explore miles of scenic areas from Mauka to Makai, take a day trip to Hana, bicycle down 10,000 foot Haleakala Crater, take a wine-tasting tour or enjoy a luau! Beach, Fitness Center and Gym with small fee (next door), water aerobics, outdoor Yoga classes and golf!! Imagine relaxing on your lanai watching the sunsets and listening to the waves, capturing the stars in the evening and enjoying the sounds of nature..... just one of the many ways to experience the richness and relaxation of the beautiful island of Maui.